You know who I love? The Young Avengers. They’re just so darn adorable. This book gave me what I needed in my comics this week: some fun. Heinberg and Cheung have, in the course of two issues, successfully resurrected the chemistry that made their original run on Young Avengers so enjoyable, and I find myself wishing for a YA ongoing again. There is excitement, fun, humor, and drama in Children’s Crusade #2, and I can’t wait to see what else Heinberg has up his sleeve. I have only one complaint about this book (sorry, I guess it’s unavoidable), and that’s its lateness, which is shaping up to be chronic. Anyone who has read Young Avengers has already experienced Heinberg and Cheung’s apparent lack of urgency—yet, when this current mini was solicited, we were told that a number of issues were already completed, written and drawn. I was pleased by the promise of regularly published issues … but it has been two months since issue #1 debuted, and it looks like #3 isn’t due out until November. Unless I’m wrong and this is a bi-monthly book, I’m not sure what’s going on here, and slightly offended as a consumer that this isn’t being taken more seriously. Hey, Marvel: If you want us to buy your stuff, you might want to consider producing it on time. But, short of it taking a year, I’ll still be on board for issue #3. This entry was posted on 09/13/2010 by ravenhaired. 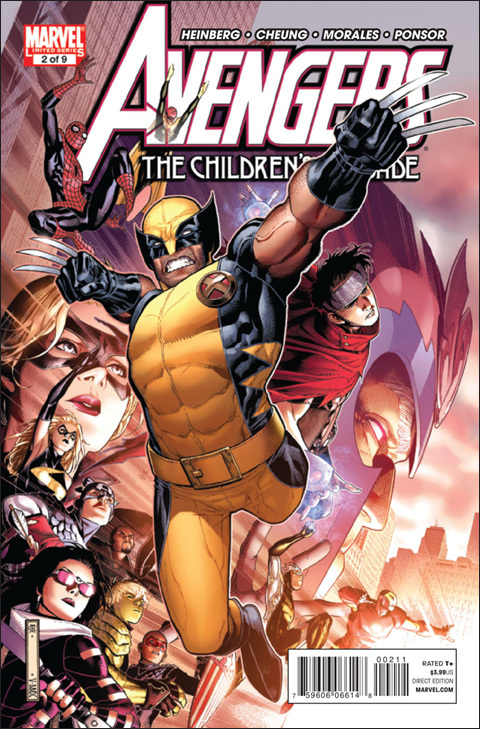 It was filed under Comic books, Reviews and was tagged with Allan Heinberg, Avengers, Jimmy Cheung, Magneto, Marvel, Scarlet Witch, Young Avengers.